Djemila means "beautiful" in Arabic and its antique name is Cuicul, set on a rocky spur which spreads at an altitude of 900 m above sea-level, between Guergour and Betame valley, about 30 miles from Setif province. It is one of North Africa's most monumental sites. It was founded by the emperor Nerva Trajan in the first century as a Roman military garrison and as home to his veterans. In 1982, Djemila became a UNESCO World Heritage Site. UNESCO refers to it as one of the most stunning and beautiful Roman ruins in the world. 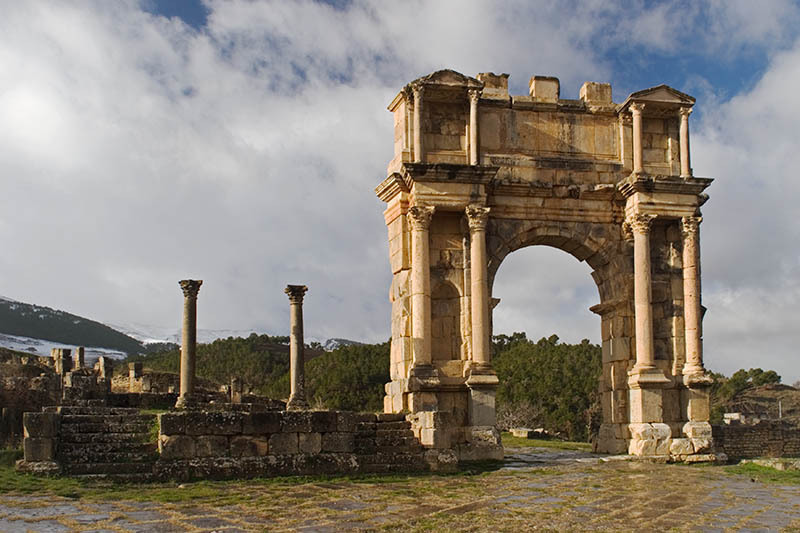 Undoubtedly, Djemila is the best well-known Roman cities in Algeria and the most well preserved and impressive. It is an outstanding example of a Roman urban architecture; with its defensive system, public convenience, triumphal arches, forum, temples, basilicas, churches, streets and houses .It is really an interesting example of Roman town planning adapted to constraints of the mountainous site. It includes also an impressive theatre, two fora, and stunning museum, where every square inch of the immense walls are plastered with mosaics, making for an intriguing and breathtaking visual view which illustrates the mythological tales and scenes of their daily life. Djemila bears an exceptional testimony to a civilization which has disappeared. It is one of the world's most beautiful Roman ruins. The archaeological vestiges, the well integrated Roman urban planning and the surrounding environment comprise the elements that represent the values attributed to this site. The site has also been marked by Christianity in the form of several cult buildings such as the cathedral, the church and its baptistery. The city was initially populated by a colony of Roman soldiers from Italy, and eventually grew to become a large trading market. The resources that contributed to the economic prosperity of the city were essentially agricultural (cereals, olive trees and farms). Djemila is among the World Heritage List since it contains all the elements necessary to express its universal value. The archaeological vestiges bear true and credible testimony to Roman town components such as the classic plan of the urban Roman town and architecture such as construction methods (roads, gates, aqueduct, colonnaded temple, theatre, etc. ), decoration (bas-reliefs, borders and pediments, capitals of columns, mosaics, etc) and construction material (stone, mosaic, ceramics, etc.) that represent the outstanding universal value of the property. In recent years, some restoration work on the mosaics in the museum has been carried out because the site is one of the Algeria‘s coolest ruins and represents an Algerian cultural heritage that must be protected. Each year, 30.000 visitors and some 15.000 students visit the site. The need for funds and international assistance is still very important for the implementation of the management plan and presentation of the site as a cultural heritage. The protection measures include the construction of a peripheral fence around the site, the restoration of damaged mosaics and the renovation of the site museum. Although deterioration causes increasing damage to the fragile archaeological structures, the values of this Roman colony are globally well conserved.